Think back for a minute to the pre-internet world. I know that feels like another millennium (and it was! ), but it actually wasn’t that long ago. Can you remember what life was like back then? More importantly, can you remember what it was like to cook back then? Recipes were in much shorter supply. You probably had your treasured recipes passed to you by family and friends, maybe a few clipped from magazines and newspapers. If you liked to cook you certainly had cookbooks – probably some basic books that reminded you how to make things like rice and pot roast, a few books of 15-minute dinners and 101 things to do with pickles, maybe a community cookbook or two assembled by your local Junior League or church group, and if you were an adventurous type, several seminal, authoritative works on the cuisines of the world. Since I (mostly) came of age in the internet era, my bookshelf looks a little different. I’ve never felt the need to stock books on the basics or quick dinner ideas, since these have pretty much always been in abundant supply online. What I have always collected is books on different cuisines, since an in-depth portrait of cultures and their foodways – apart from being my passion – is something that has always seemed more at home between the slightly-yellowed pages of a book than on the cold light of the monitor. There was also the question of expertise: when I delved into the food of another culture I wanted to know I was getting as complete and accurate a taste of it as possible, and this usually meant trusting people whose credibility on the subject was well established. After all, somebody needs to be convinced an author knows what they’re talking about before they’ll go to the trouble (and expense) of publishing a book, right? Blogs, however, are changing all of this. While we still value books written by recognized experts, blogs allow us to sidestep them and go straight to the source. They’ve opened direct conduits into kitchens around the world; as long as there’s a common language spoken (and we’re particularly lucky in this department as English speakers), there’s a chance to learn from cooks anywhere on the planet. No longer must we wait for someone to interpret and codify a cuisine for us, we can go directly to those who cook it every day. Exciting times, these. Unfortunately the blogosphere has grown so labyrinthine in recent years that finding these blogs – particularly the good ones – is not always easy. Not many of these blogs are really mainstream, and for every one that is there are plenty more that aren’t. That’s why I’ve decided to run a little series introducing a few of them. Specifically I’m focusing on blogs that I consider exemplary ‘culinary ambassadors’ for the food of a specific country and/or region. These are bloggers who, in addition to being knowledgeable and articulate, take the time to explain unfamiliar ingredients and techniques, and go beyond recipes to explore the cultural context of the food they share, including why, when and how it’s eaten and what personal history they have with it. Some of these blogs are written by people still living in their country of origin; others are written by expats. Many of these blogs have been around for a while, though the majority are quite new to me. Hopefully some will be new to you too. The first blog I’d like to introduce you to hails from India, one of the most diverse culinary landscapes on the planet and home to some of my very favorite food. Anita lives in Delhi, and her blog A Mad Tea Party practically verges on dinosaur status, having been around since mid-2006. I had no doubt stumbled across it before, but I didn’t start to read it in earnest until a search for my favorite rice pudding of all time led me there (but more on that in a minute). Anita is eloquent and extremely knowledgeable about many types of Indian cuisine, but what reeled me in was her insights into the food of Kashmir, the border region between India, Pakistan and China where she comes from. I’ll admit that before finding Anita’s blog I probably could not have named one typical Kashmiri dish. I certainly couldn’t have told you that there are separate Hindu and Muslim cuisines, that the staple of British Indian restaurants called ‘Rogan Josh’ is actually a Kashmiri classic, and that things like yogurt, mustard oil and pungent asafoetida are widely used whereas garlic and onions are not. But I now know that Kashmiris drink a very different cup of chai from anyone else in India, flavoring green tea with cardamom, cinnamon, almonds and saffron and calling it Kahva. I also know that a simple dish of greens called Haak is capable of inspiring near-religious zeal among Kashmiris, and that spiced goat meatballs called Mutsch are one of the five things you must eat before you die (okay, so I’ve apparently been in possession of that knowledge for a while, but my memory isn’t what it used to be!). I was also intrigued by a Kashmiri version of the pan-Asian congee called Ver, which stands quite on its own by featuring walnuts, mustard oil and a complex local spice blend called veri masala. My favorite recipe of Anita’s, though, is the one that led me to her site: Kheer, or Indian rice pudding. I’ve been looking for a good kheer recipe for years, ever since my student days in New Orleans. Back then I used to go with a group of my friends to the local Hare Krishna temple on Sunday evenings where they offered a free Indian meal to the public (in exchange, of course, for listening to a little proselytizing – not a bad tradeoff for starving students!). All the Krishnas’ food was pretty good, but their dessert, a milky pudding fragrant with basmati rice, was a showstopper. Almost thin enough to sip, it bore little resemblance to the thick, stodgy glop I was familiar with (can you tell I’m not much of a rice pudding fan?). I fell in love (with the pudding, not the Krishnas), but unfortunately I never managed to find a recipe that produced anything nearly as good – until I found Anita’s. Anita is justifiably proud of her kheer, calling it ‘a Mad Tea Party original’ and a recipe she worked long and hard to perfect. I’m not surprised – it’s pretty spectacular, balancing the richness of long-simmered milk with the delicate fragrances of basmati rice and cardamom. Almonds lend it a bit of gentle crunch, while saffron (one of Kashmir’s most iconic crops) lends a beautifully golden color and a touch of its haunting perfume. Straddling the line between exotic and comforting, it’s the kind of dessert I could easily see myself eating every night of my life, and I very well could considering how ridiculously easy it is to make. It does require a good chunk of time but far less active involvement than you’d expect – particularly compared to some Indian desserts which chain you to the stove for unfathomable lengths of time. The only negative I can think of is that it verges on too good; just knowing it’s sitting there in the fridge seems to render me incapable of walking past it without stopping to take a bite. Somehow the entire first batch I made disappeared without having officially been served. But of course, that was just the excuse I needed to whip up a second one. Apart from sending you over to Anita’s to look at the photos of the rice at different stages of cooking, I can only think of a couple of things to note here: the first is that between soaking, boiling and letting the kheer cool, you’ll need several hours for this dessert, so plan ahead. Letting it chill completely is particularly important since this is when all the flavors get cozy with each other. The second is that I’ve called for a little less sugar than Anita, but by all means adjust the amount to your taste. You’re best off starting with less and tasting as you go. Soak the rice in cold water for an hour. Drain. In a heavy-bottomed pot (not too wide and shallow or the milk will evaporate too quickly), combine the milk and the drained rice. Bring to a boil, and reduce the heat to the minimum needed to keep it boiling. Leave a wooden spoon in; this will prevent the milk from boiling over. If you are using a sufficiently heavy-bottomed pan you’ll only need to stir about once every 5 minutes. But don’t stray too far; keep an eye on the milk while doing something something else in the kitchen. After about 20 minutes the rice will be cooked, and after another 10 it will start to break up. After about 40 minutes of cooking, reduce the heat slightly and stir continuously for the next 5-7 minutes. At this point the rice will have nearly disintegrated. Turn the heat off, add the remaining ingredients and stir. 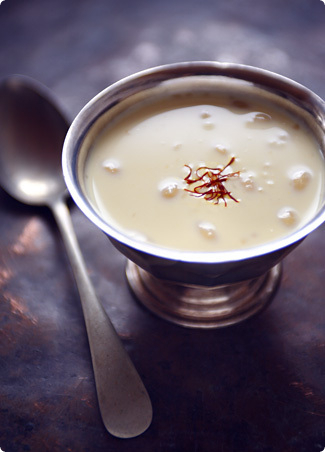 Transfer the kheer to a covered container and chill completely in the refrigerator. Serve cold. I love Anita’s blog, too. Both her writing, and her food. Oh how excited I am to try this recipe. Thanks for such a beautiful and inspiring blog. I’ve been on an Indian food kick lately- just recently made a North Indian/ Pakistani goat curry (Aloo Gosht). Thanks for pointing me towards Anita’s blog- it’s always great to have more resources. That is a great idea. I often think how easy it is to miss wonderful blogs, and I feel very fortunate when I stumble upon one. I still have at home a couple of basic cooking books, when I need to review the classics. I find them quite useful. I also have several regional Italian cookbooks – a lot of this stuff does not make it to the Internet yet because it is considered too ‘poor’ and it relies heavily on local ingredients that are quite difficult to substitute. Thank you so much for posting this recipe! I studied abroad in Italy for a year, and one of my colleagues there was from India. She made kheer for a Christmas potluck, and it was a huge hit. I’ve been dreaming of it ever since, but never came across an authentic-looking recipe until now. I’m so excited about the series! I too feel that it gets harder and harder to find really good and interesting blogs and websites. It’s such a huge "library" you are facing and it gets bigger all the time! But what a wonderful feeling it is when you find a new one to follow! (like yours a month ago..) The blogs and the internet really have given us so many new opportuneties to find and share recipes. It’s hard to imagine the time before the internet, isn’t it?I love cookbooks and can’t imagine that the internet could replace them fully (like I can’t imagine that I would prefer a electronic book over the "old-fashioned" one either). Maybe I’m really old-fashioned in that way. Great post!! !Thank you very much. melissa, melissa, that was a kick below the belt… how do I feel now, i celebrate my blog birthday today, and started in 2004 – if mid-2006 is dinosaur, what am I???? gulp. This recipe, and this blog, look fantastic. You write beautifully, and I can’t wait to read more. I will definitely try this recipe (substituting Truvia or agave nectar for the sugar), and I will also check your your recommended blogs and "favorite" yours. Thanks! Have not made any Indian sweets yet and am very very curious to try your recipe! love the simplicity of both the recipe and your photo! Nice intro leading to a funny story, and a great intro to a fabulous blog. Thank you. oh. oh my. i can’t decide which i’m more tipsy over, the mad tea party blog, or the rice pudding. i’m a long-standing stodgy fan, myself, but a democratic rice pudding fan, also. add cardamom and basmati and what’s not to love??? dear me. Dear Melissa, kheer has to be my favourite Indian dessert. Thank you for inspiring me to make it at home with a beautiful post and a fabulous blog recommendation! Wow that’s divine. Do you know this new Asian-inspired food blog http://www.doublecrown-nyc.com/expeditioneast/ It seems right up your alley! Thank you for sharing this recipe. I have an East Indian neighbour who makes a "kick___" kheer as well and she gave me the recipe too but it never turns out like hers! Now, I know why. I tweaked the recipe (I hope you don’t mind ) and added a dry tangerine peel and it tasted great as well! I recently discovered your blog (via Delicious Days) and have been enjoying it enormously – so you can imagine how thrilled I was to read this post! Thank you in advance. I am looking forward to reading and learning from this new series of posts immensely. I love so much Kashmiri Kheer. This blog is wonderful. Thank you for sharing the idea with us.